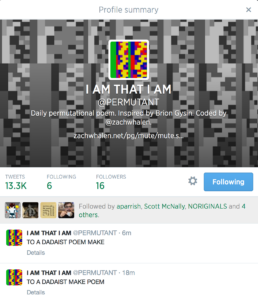 This bot, inspired by and named after a famous 1960 poem (and concept) by Brion Gysin, publishes a daily permutational poem on Twitter. 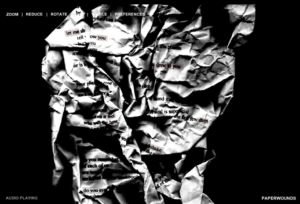 Each poem consists of 120 lines, derived from permutations of the first line (and title), and tweeted about 5 lines per hour on a semi-random timer, taking a day to publish completely. As of the publication of this entry, it is beginning the third cycle of tweeting its (currently) 65 poems. 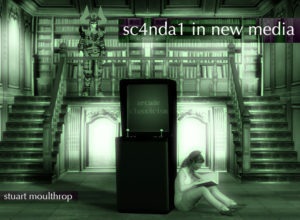 “sc4da1 in new media“, a Flash poem/rage-game by Stuart Moulthrop, is as outrageous as it is delightful. The piece is composed of two alternating interfaces: a rage-game remediation of Pong; and a transient text. Every time you beat a level of the remediated Pong, you access a new installment of the transient text. There are six levels to the remediated Pong. The perversity of this rage-game version of Pong makes Chiku’s “Syobon Action” (“Cat Mario”) a piece of cake in comparison. I almost broke a vocal cord when I made it to level 6. 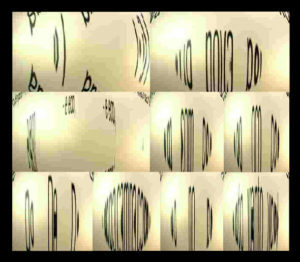 “Memory” is an interactive digital poem composed by kinetic texts and speech sound programmed in Flash by Brazilian researchers and digital poets Alckmar Luiz dos Santos and Gilberto Prado. On Monday, August 19, 2013 I presented some of my data visualization work at the Visualizing Electronic Literature seminar and workshop at the University of Bergen. 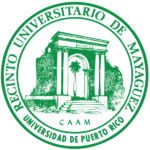 Because I was unable to physically attend, I prepared the following video presentation. 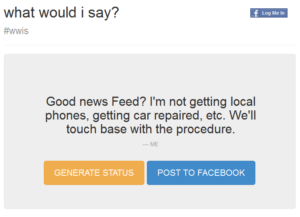 For more information, see my entry at leonardoflores.net.